Eleanor Strode, daughter of James Strode, was born about 27 June 1760, in Berkeley County, Virginia. Although her parents were “respectable members of the society of Friends,” Eleanor joined the Episcopal Church as an adult. According to the Rev. C. W. Andrews, she was baptized “in the noble river which flows near us, by the Rev. Mr. Veazey, in the year 1789.” Eleanor’s name is first in the list of communicants of Trinity Episcopal Church created by Rev. Andrews in 1842. On 27 December 1780, Eleanor married Abraham Shepherd, son of town founder Thomas Shepherd. Daniel Sturges, rector of Norborne Parish, performed the ceremony. Eleanor and Abraham had eight children, and their births were recorded in Eleanor’s bible. Abraham died in 1822, and in 1837, Eleanor was granted a Revolutionary War widow’s pension of $480 per year. Eleanor’s son, Rezin D. Shepherd, is remembered for donating substantial funds toward the building of the current Trinity Episcopal Church, but Eleanor contributed more than $800 to the building of the Old Trinity Church at the corner of Church and High Streets. She also contributed $1,000 toward the purchase of the Rectory property. This is an astonishing sum of money considering that in 1850, Eleanor had $10,000 in real property, while Rezin D. Shepherd had $240,000. Eleanor died 24 September 1853, and was buried in Shepherd Burial Ground in Shepherdstown. Berkeley County, Virginia Wills 2:300-303, James Strode, recorded 28 April 1795; “West Virginia Will Books, 1756-1971,” database with images, FamilySearch (https://familysearch.org/pal:/MM9.3.1/TH-1-18264-35204-17); citing county courthouses, West Virginia. FindAGrave, database with images, (http://www.findagrave.com/cgi-bin/fg.cgi?page=gr&GRid=6827287), memorial 6827287, Eleanor Shepherd (1760-1853), Shepherd Burial Ground, Shepherdstown, Jefferson County, West Virginia, gravestone photograph by Stephen DeFreytas. C. W. Andrews, Memorial; Being an Address Delivered at the Funeral of Mrs. Eleanor Shepherd; with a Historical Notice of the Earlier Ministers and Supporters of Trinity Church, Shepherdstown, Virginia, from the Year 1762 (New York: Anson D. F. Randolph, 1855), 10-11 Hathi Trust (http://hdl.handle.net/2027/hvd.hx4teg). Trinity Episcopal Church (Shepherdstown, W.Va.), “Record Book,” p. 1, line 1, Eleanor Shepherd; parish office, Shepherdstown. Berkeley Co., W.Va., Marriage Record, [no vol. ]: 339, Abraham Shepherd-Ruaner [?] Strode, 27 December 1780; database with images, “Marriage Records,” West Virginia Division of Culture and History (http://www.wvculture.org/vrr/va_view.aspx?Id=12500962&Type=Marriage). Berkeley Co., W.Va., Will Book 1: 61-65, Thomas Shepherd Will, 1776; “West Virginia Will Books, 1756-1971,” database with images, FamilySearch (https://familysearch.org/pal:/MM9.3.1/TH-1-18264-35579-43). Berkeley Co., W.Va., Marriage Record, [no vol. ]: 339, Abraham Shepherd-Ruaner [?] Strode, 27 December 1780. Also James Morton Callahan, History of West Virginia Old and New in one Volume (Chicago and New York: The American Historical Society, Inc., 1923), p. 258; digital copy, Internet Archive (https://archive.org/stream/historyofwestvir01call#page/258/mode/2up). Ibid. Also FindAGrave, database with images, (http://www.findagrave.com/cgi-bin/fg.cgi?page=gr&Grid=6827233), memorial 6827233, Abraham Shepherd (1754-1822), Shepherd Burial Ground, Shepherdstown, Jefferson County, West Virginia, gravestone photograph by Stephen DeFreytas. Eleanor Shepherd, widow’s pension application no. W.19343, for service of Abraham Shepherd (Continental Virginia). Bishop Meade, Old Churches, Ministers and Families of Virginia (Philadelphia: J. B. Lippincott & Co., 1861), vol. II: 285; digital copy, Internet Archive (https://archive.org/stream/oldchurchesminis02meaduoft#page/294/mode/2up). Also Samuel Gordon Smyth, A Genealogy of the Duke-Shepherd-Van Metre Family from Civil, Military, Church and Family Records and Documents, (Lancaster, PA : The New Era Printing Company, 1909), 408; digital copy, Google Books (https://books.google.com/books?id=JXdIAAAAMAAJ&pg=PA408). 1850 U.S. census, Jefferson County, Virginia, population schedule, 28th District, p. 328B (unpaginated], dwelling 533, family 541, Eleanor Shepherd; also dwelling 530, family 537, Rezin D. Shepherd; FamilySearch (https://familysearch.org/pal:/MM9.3.1/TH-266-11594-139096-31); citing National Archives and Records Administration microfilm M432, roll not given, Washington, D.C.
 Jefferson County, W. Va., Register of Deaths (1853), p. 4, no. 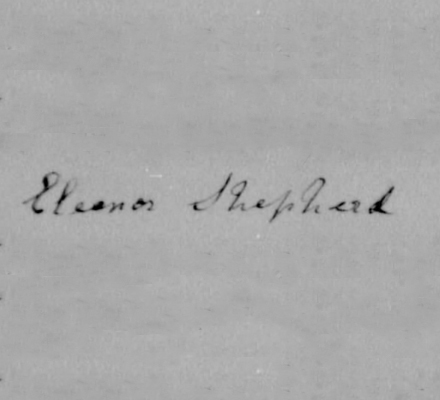 36, Eleanor Shepherd, 24 September 1853; West Virginia Division of Culture and History (http://www.wvculture.org/vrr/va_view.aspx?Id=4597667&Type=Death). FindAGrave, memorial 6827287, Eleanor Shepherd (1760-1853), photograph by Stephen DeFreytas.